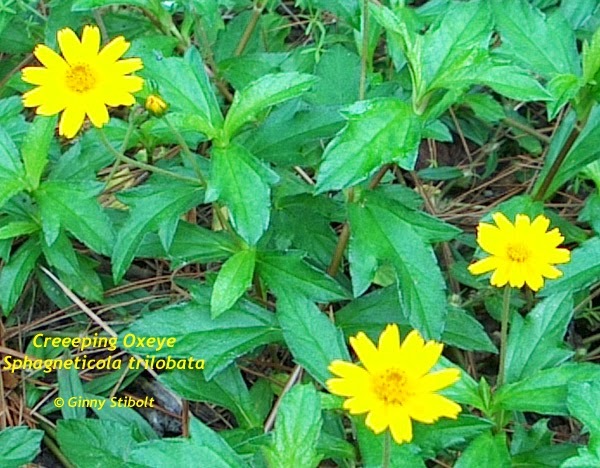 Wedelia or creeping oxeye daisy (Sphagneticola trilobata): a beautiful invader. When we moved into our house here in North Florida, we let several areas of lawn grow out. I've written about this several times. See From lawn to woods: a retrospective, for what has happened out front. Here's the other half of the story. Our 1.5 acre lot is long and pie-shaped. Out back is a narrowing strip to the lake. We decided early on that we'd not continue to mow this whole area and just leave a pathway that could be mowed with one trip down and one trip back on the riding mower. The area opens up by the lake, so there is more mowing to do down there. 2007. Vast section of lawn that we let grow out became engulfed by wedelia. Looking back toward the house from the pathway to the lake. 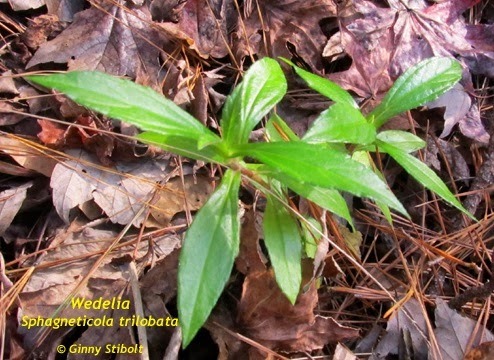 By 2007, the wedelia, which had been controlled in the lawn by mowing, grew like crazy. So it was time to strike back. I did not want to kill everything in the area, so pulling was the best option. And with some follow-up this has worked pretty well. Pulling the wedelia by rolling it up like a rug. Yes, leather gloves were necessary here. 2007. A work in progress: pulling the wedelia from the slope next to the shallow ravine between our property and our neighbor's. This photo was taken from approximately the same place as the above photo, but looking toward the lake. I started the removal project on the other side of the path where the wedelia was covering ferns, small beautyberry bushes and other desirable vegetation. 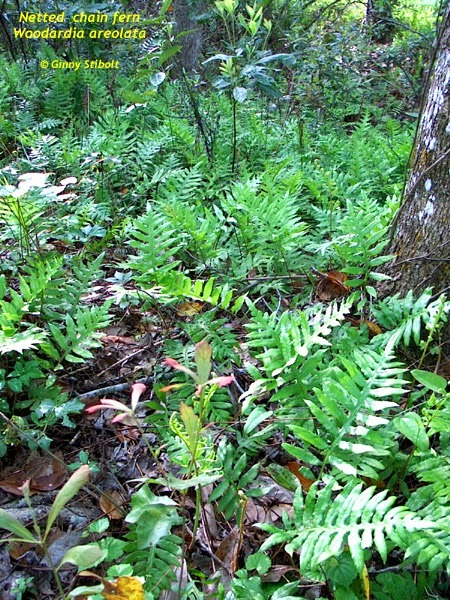 You can see some of the ferns, mostly netted chain ferns (Woodwardia areolata), in the above photo. 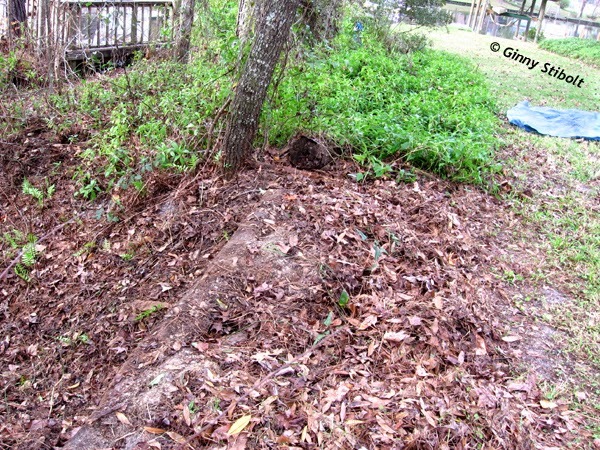 One good reason for tackling this project in the winter is that the ferns die back in the winter. It didn't take long for the ferns to totally fill in this ravine and slope, which is what I'd hoped for. 2009. These ferns are lovely for most of the year. They die back only for a couple of months here. 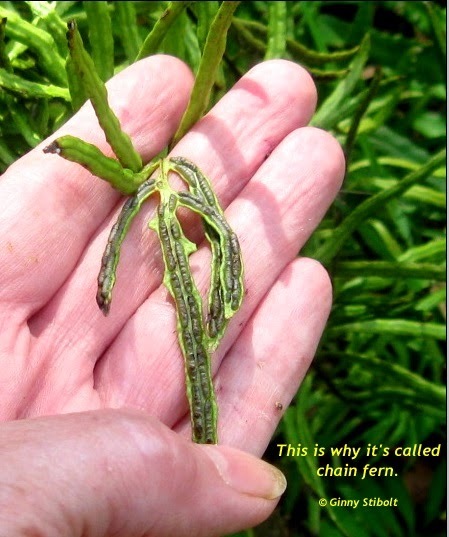 The fertile fronds bear a chain of sori that hold the spores. Because it's invasive and because there are parts of the plants that did not get pulled, it's necessary to check for new sprouts on a regular basis. The first year after removal, I checked every other month. For a couple of years I checked twice a year. Now I check every other year, because I sure don't want to start all over again. So a few weeks ago, I found a few sprouts at the bottom of the ravine where it's dampest and more near the lake shore. A sprout found on my latest foray. 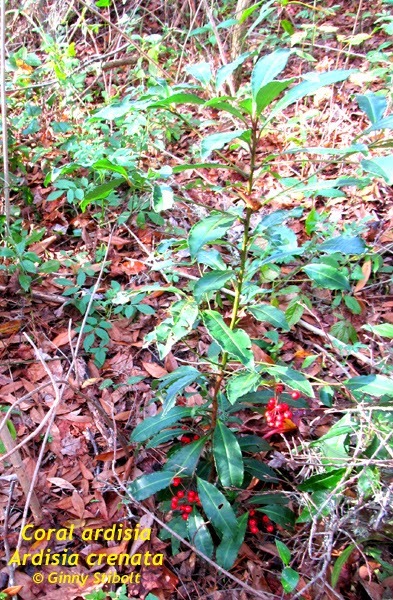 the other big invasive on our property coral ardisia. On the upland side of the path, the plant community has changed from a meadow-like area to a wooded ecosystem and is filled with small trees. It has become too shady for the wedelia to take off, but I still found a few sprouts. 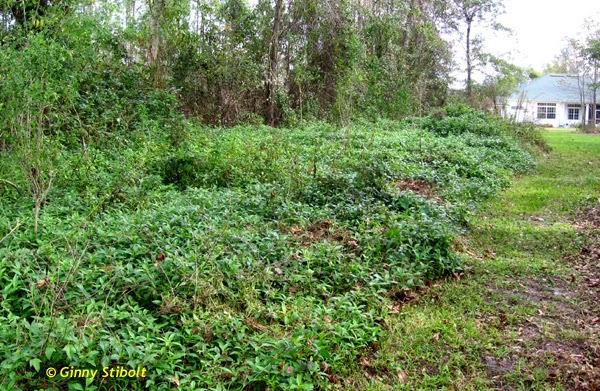 I also found a fair number of coral ardisia (Ardisia crenata) plants and some wild taro (Colocasia esculenta). So while I was removing invasives, I worked on all of them. I'll cover the transformation of this area in a post later in the year. 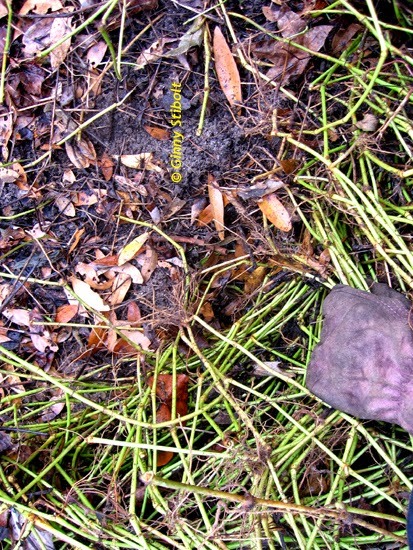 For more information on what is invasive in Florida, see the Florida Exotic Pest Plant Council Invasive website, which has not only the list of the 76 most invasive plants in Category I and the potentially invasive list in Category II, there are links for most of these invasive plants for more information. I know that my maintenance removal project will continue because so many of my neighbors continue to grow these plants, but at least our property will become less of a problem going forward. 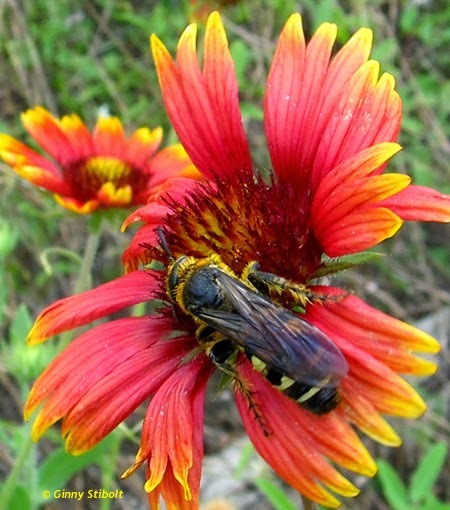 Making room for native plants is so important for the heath of our environment. I'm working on doing my part. Are you?